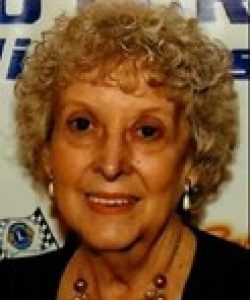 Virginia L.”Ginger” (Johnson) Camarda, 84, of Grant St., died peacefully at her home on Saturday, April 13th 2019. She was the wife of Joseph J. Camarda who died in 2005. She leaves her daughter Linda M. Lusignan and her husband David of No. Brookfield; her sons, Michael F. Camarda of Fl., Peter J. Camarda of Spencer and Bruce A. Camarda and his wife Lisa of Warren; a brother Warren E. Johnson and his wife Carol of Purcellville, Va.; 7 grandchildren, 2 great grandchildren, nieces and nephews. Born in Worcester, she was the daughter of Frank and Alice (Bohlin) Johnson and graduated from Leicester High School and later Green Mt. College in Vt.
She was a longtime member of Our Lady of the Angels Parish and the Leicester Lions Club. Most recently, she frequented the No. Brookfield Senior Center and was past President of the Friends of the Senior Center. A funeral Mass will be held on Tuesday, April 16 at 10 a.m. in Our Lady of the Angels Church, 1222 Main St., Worcester. Burial will follow in Worcester County Memorial Park, Paxton. A calling hour will precede the services on Tuesday from 8:30 to 9:30 a.m. in the MORIN FUNERAL HOME, 1131 Main St., Leicester. Memorial donations can be made to: Leicester Lions Park of District 33A Sight & Hearing Fund, c/o Leicester Lions Club, P.O. Box 307, Leicester, MA 01524.